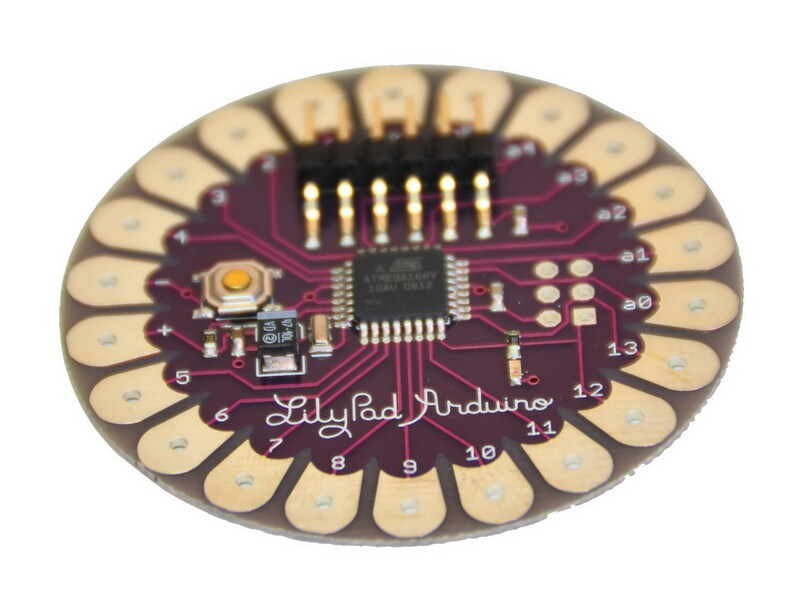 The LilyPad Arduino is a microcontroller board designed for wearables and e-textiles. It can be sewn to fabric and similarly mounted power supplies, sensors and actuators with conductive thread. The board is based on the ATmega168V (the low-power version of the ATmega168) (datasheet). 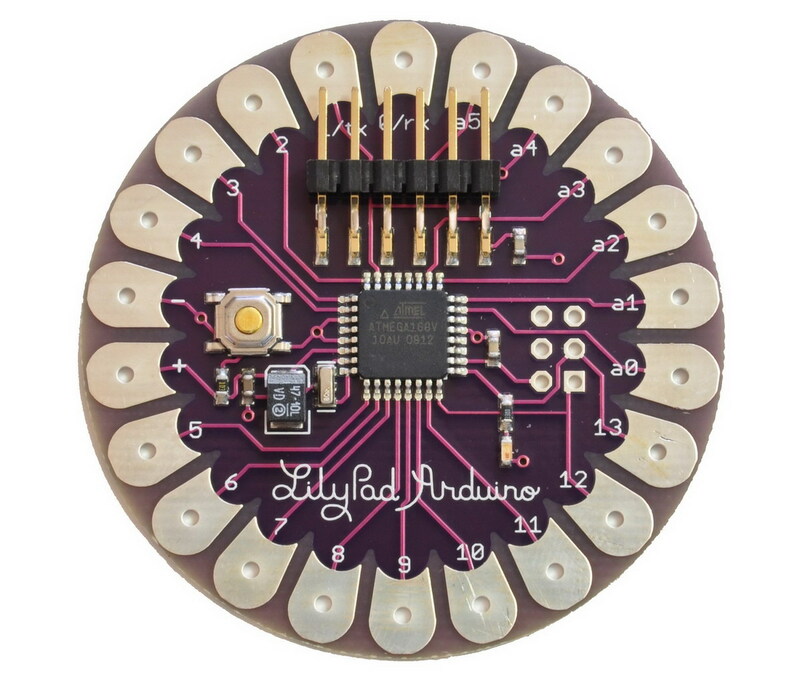 The LilyPadArduino was designed and developed by Leah Buechley and SparkFun Electronics. The LilyPad Arduino can be programmed with the Arduino software (download). *Note*, the LilyPadArduino should only be programmed with software versions 0010 or higher. You can program it with earlier versions, but all of the time related functions will be off (twice as slow as they should be). The ATmega168V on the Arduino LilyPad comes preburned with a bootloader that allows you to upload new code to it with the Arduino software. The bootloader on the most recent LilyPad boards is Limor Fried’s “no wait” bootloader. When the LilyPad is supplied with power, its Arduino sketch starts immediately. The bootloader is triggered only when the reset switch is pressed. You can also bypass the bootloader and program the ATmega168V through the ICSP (In-Circuit Serial Programming) header; see these instructions for details. The LilyPad Arduino can be powered via the USB connection or with an external power supply. If an external power supply is used, it should provide between 2.7 and 5.5 volts. This can come either from an AC-to-DC adapter (wall-wart) or battery. Again, don’t power the LilyPad Arduino with more than 5.5 volts, or plug the power in backwards: you’ll kill it. 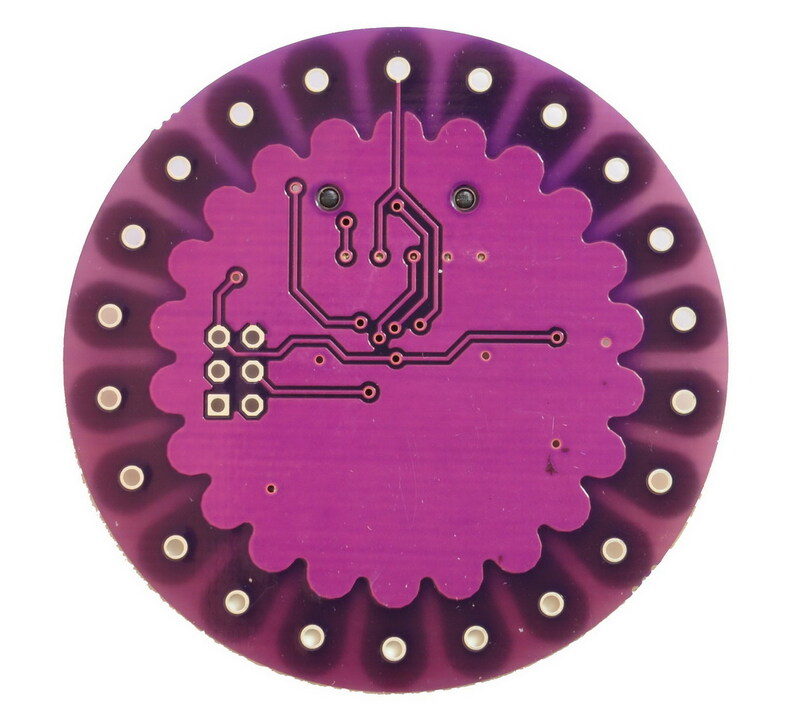 The LilyPad Arduino is a circle, approximately 50mm (2″) in diameter. The board itself is .8mm (1/32″) thick (approximately 3mm (1/8″) where electronics are attached). Wash at your own risk – we do ;). We recommend washing projects by hand with a mild detergent. Drip dry. Make sure you remove your power supply first!